There’s nothing particularly outstanding here, but I thought I’d throw up a few snaps from recent school visits and walk you through a typical arrangement. Yes, that’s truly “a good sign” for any author visit. It is welcoming and shows that the school has invested time and thought into the visit. I’ve said it a thousand times: Authors don’t do school visits, schools do author visits. I visit elementary schools and middle schools. Next week, for example,I’ll even be speaking to 380 students in one packed auditorium, grades 7-12. When I visit traditional K-5 elementary schools, I try to arrange to meet with K-only groups for shorter, more intimate visits. Then I’ll see groups of grades 1-2, grades 3-4, and grade 5 only. My material and message seems to fall in line with those groupings. When I see grades 5-only, it allows me to include in my presentation a bit about Bystander and bully-themed issues. It’s a little older, more mature, a little deeper. For K-only, I’ve learned that it’s best to sit in a chair, speak softly and gently. I tell kids how the bear in Wake Me In Spring reminds me of my father, snoring in his big, comfortable chair. Reading from the first chapter of Bystander. I’ve pretty much got that thing memorized. 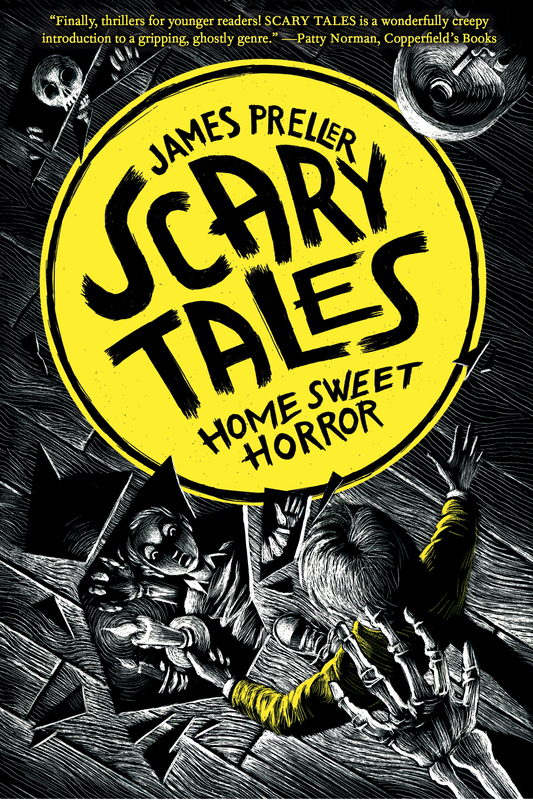 This is a grades 3-4 group, where they are extremely enthusiastic about “Scary Tales.” We talk a lot about the creative process here, building a story. The photo on the screen is of a swamp. I’m talking about the setting of one of my stories, one of the basic building blocks of any story: where, who, what; setting, character, plot. For grades 1-2, I tend to center it around Jigsaw Jones and writing from real life. A local reporter, Tracey Putrino, sat in for one of my presentations during a recent school visit to Fair Lawn, New Jersey. The school itself was spectacular, warm and clean and bursting with pride, one of the sweetest elementary schools I’ve ever had the honor to visit. 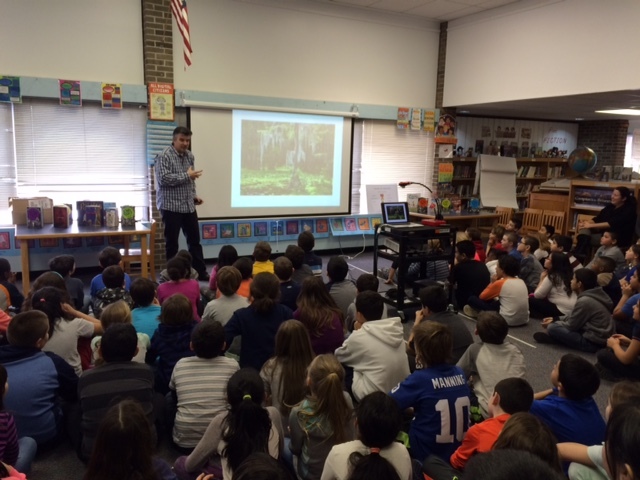 I’ve said it a hundred times: Authors don’t do school visits; schools do author visits. And this was one school, friends and neighbors, that did it up right. My thanks goes out to the entire school, including Leo the Janitor! Thanks, also, to Tracey Putrino, who did a really nice job on the article. NOTE: I took photos with my bewildering phone, various decorations and learning activities that each class created in anticipation of my visit. The school looked so welcoming and awesome. Unfortunately, every photo appears upside down when I try to post here — and I can’t figure out how to fix it. Grrrrr. A children’s author encouraged students at Westmoreland Elementary School in Fair Lawn to use what makes them unique as inspiration in their own writing. 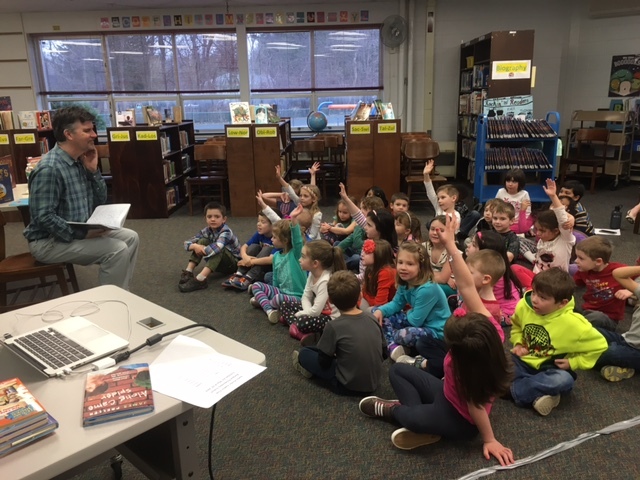 Students at Westmoreland Elementary School in Fair Lawn were eager to ask children’s author James Preller their questions during his visit to the school on April 12. 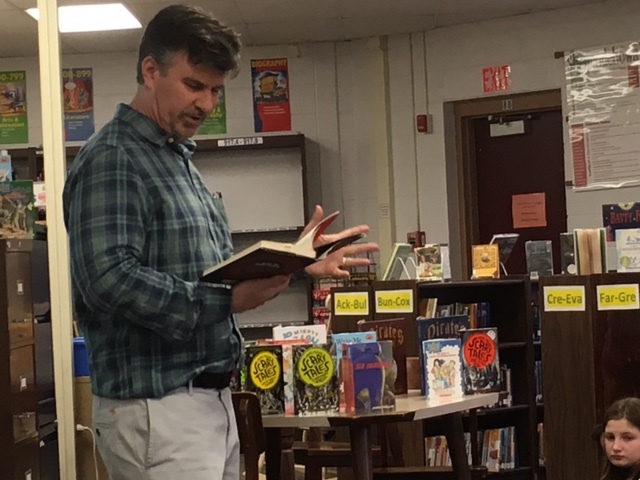 “Enjoy what he has to share,” said Principal Christy Dell’Aglio as she introduced James Preller during his visit to the school on April 12. 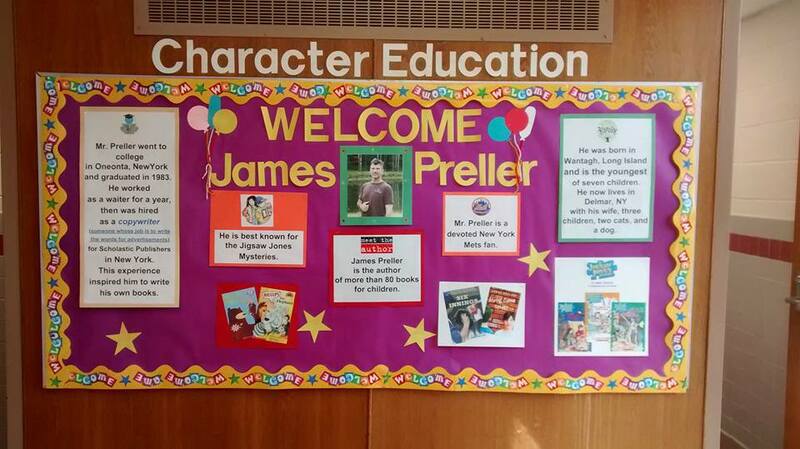 Preller of Delmar, N.Y., has written more than 80 children’s books including about 40 as part of the “Jigsaw Jones” mystery series. Using the uniqueness of fingerprints as an example, the author told students to consider what makes them unique because no one else has their parents, siblings or experiences. “Begin with your life,” he said. Preller has done the same with his stories and characters. Whether it came from being the youngest of seven children, his love of baseball or his memories of his grandmother, he said those experiences can lead to ideas. “Where do you get ideas?” he asked the group of second- and third-graders during one of the three presentations he did during the visit. From their head, feelings, observing what happens around them, books and things that happen to them and their friends were some of the answers. Preller said an idea is just “a little seed” that can grow. He urged students to make lists and keep writing journals to jot down ideas that could later become stories. As an example from one of his books, he said he was listening to the radio when he heard one of the announcers say, “You can’t hide broccoli in a glass of milk.” The line stuck with him and ended up in a scene with Jigsaw Jones when his friend, Joey, stays over for dinner in “The Case of the Million Dollar Mystery.” He read the passage to students as Jigsaw’s father asked him to finish his glass of milk than was beginning to turn green from the broccoli. “A writer’s two most important words are what if?,” said Preller, noting if they ask that question and follow the path it can lead to a story. The writer told students it is never too early for them to make their own books. He showed them an example of one of his earliest works that he wrote and illustrated about Tarzan. While he was not much of a reader as a child, Preller said he did love baseball and always checked out the box scores and read the sports section of the newspaper. “My love of sports made me a reader,” the writer said. 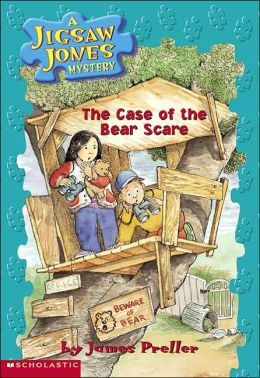 His Jigsaw Jones book, “The Case of the Bear Scare,” came from reading newspaper articles about bears showing up in neighborhoods. As the father of three, his experiences with his children have also sparked ideas. 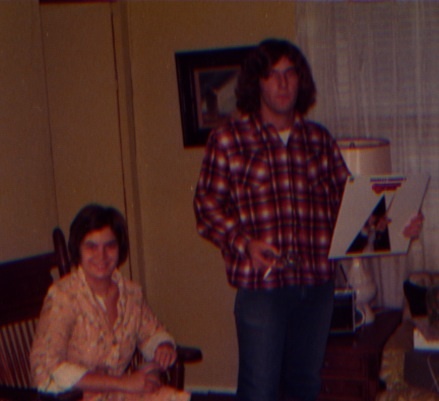 When his daughter asked him he had ever heard the story of Bloody Mary, the story about a ghost who appears in a mirror became a scene that he read to students from one of his newest books. 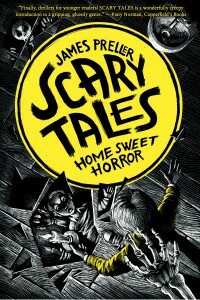 It is part of a new series called “Scary Tales” that will be released this summer. I love looking at these faces. 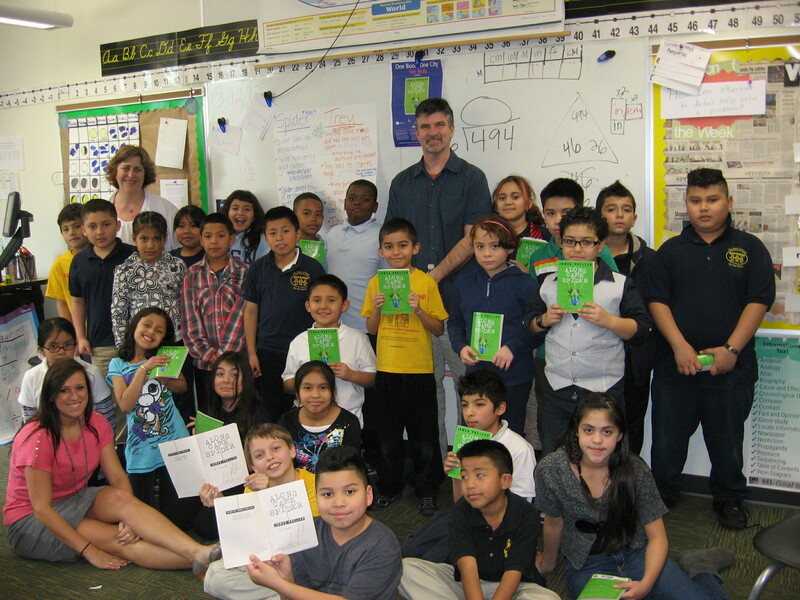 This class, along with every other 4th-grade classroom in Grand Rapids, Michigan, received free copies of my book, Along Came Spider, as part of their “One City, One Book” program. Then they entered a contest and won a visit from the author. How come I feel like the winner? This isn’t the sort of letter I normally share, but boy is it ever relevant to my life lately. 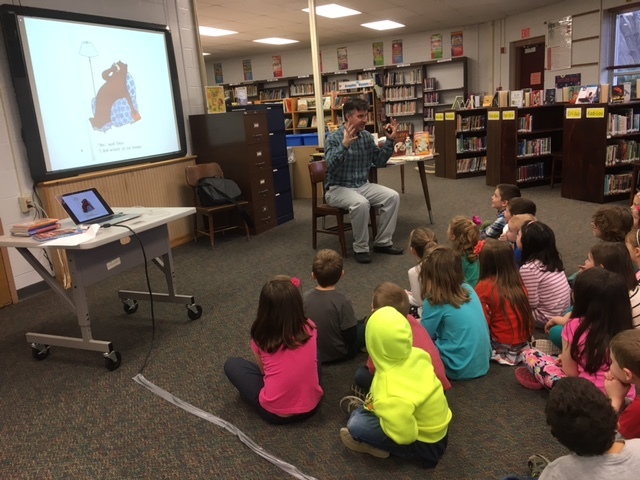 This is the time of year when I field many inquiries about my availability for school visits. For educators who’d like help on that, I’ve posted on the topic many times before . . .
* Quickie overview of a standard visit. 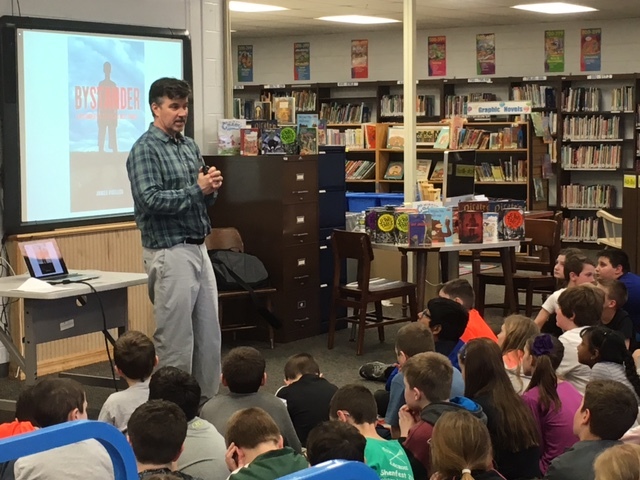 * An author’s perspective, featuring my mantra: Authors don’t do school visits; schools do author visits. 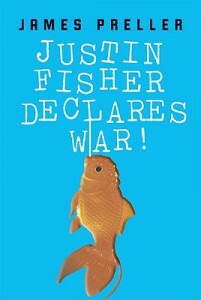 * One Book, One School: Some reflections. Anyway, just in the next two months, I’m looking at trips to MA, CT, NC, SC, and FLA. And I’m in discussion with educators in MI, NJ, CO, OH. It’s a change from my pre-hardcover life, when most of my visits were local. These far-flung visits require a lot more organization from the schools, because I can’t possibly visit a school for one day in, say, Kentucky. I’d spend more time traveling than working, and that’s a crazy commute. Here’s a letter that is very kind and somewhat typical. We’re wondering if you’d be available to visit MI in March 2011. 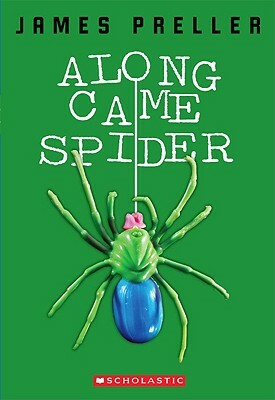 We’ve tentatively chosen Along Came Spider as our One Book, One City for Kids title, but we’d really like to have the author visit us after the kids have finished reading it. I think our kids would really enjoy meeting you! We purchase a paperback copy of our OBOC for Kids title for every 4th grader in the city, hoping that that will help get the word out about how much fun reading can be. The students start reading in January and then usually have the author visit for a couple days in March, visiting 4 schools. We’re flexible about the dates, and have run the program from March to May instead, but would really like the January – March reading months as our first pick, with you coming here two days in March. Those dates have typically been a Monday/Tuesday. We’ve had good luck with school visits then. We’re curious about your availability, and of course, we need to ask the questions about fees and travel accommodations before we make final decisions. Thanks, and we look forward to hearing from you soon! I’ve got to figure out some kind of proactive approach to this recurring “problem” (in quotes!) in my professional life. Because it’s killing me. So, long story short: Yes, thrilled, I absolutely WANT to visit Grand Rapids. I’d love to do it. The time-frame is still open for me. However, I live near Albany, NY, so there are travel hurdles to overcome. I haven’t looked into the reservations, but I assume it would not be direct, making the travel pretty time-consuming. A lost day. My basic policy — and believe me, I’m still trying to figure this out — is that I need 3-5 days worth of visits to make the travel worthwhile. I have to add, I’ve been fielding many requests for Bystander lately, so your interest in Along Came Spider both surprised and delighted me. I love that book, but recognize that it’s fairly quiet and, frankly, hasn’t been a huge seller (though it earned some very nice attention). 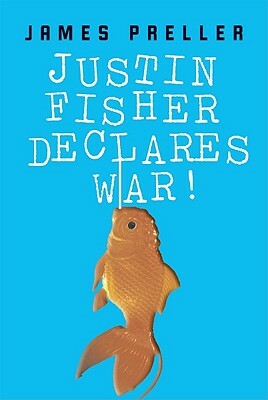 Have you seen the companion book, Justin Fisher Declares War? 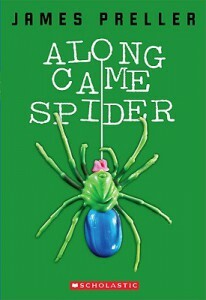 Same school, different teacher, but some overlap with students (Trey and Spider make cameos). I’m sorry, I really am, because I understand that good people tried their best, but I get depressed every time I look at these covers. What do they communicate about the books? The ex-boy in me thinks, Yuck. Does saying so make me a bad person? I’ve been meaning to blog about a visit I enjoyed last year, when a school district in PA coordinated their efforts for a full 5-day visit. It was such a rewarding experience, because the librarians knew each other, used parental volunteers, and we even got to go out for a nice dinner and drinks one night. I really think that’s the model on how to do it, when hoping to attract authors who must travel. It requires more planning, but I think the payoff is huge. Anyway, um, I’d love to hear that you think some other area schools might like to hop on the bandwagon. As you may know, I have titles for grades PreK-8, and am still most popular for my Jigsaw Jones series, so hopefully I might be appealing to other elementary schools. Please stay in touch. And thank you — thank you, really — for giving this your time and effort.